Hopefully you can fly through the air and use heat vision because we now have the 100% polyester Superman Suit Up Costume T-Shirt! Oh, you are just a human and don't have those super groovy Kryptonian powers? That's okay...you can just fake it! 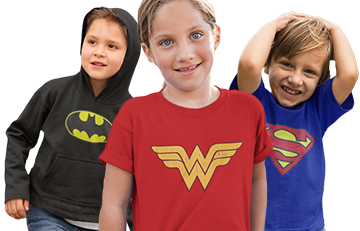 Fully sublimated(both front and back) and coming with a detachable cape, the Superman Suit Up Costume T-Shirt is both costume and something you can wear everyday! 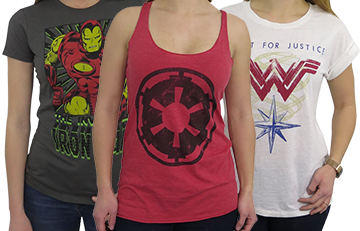 These are not your typical shirts; sublimation is a viable and durable solution to the industry standard of ink jet heat transfers. The sublimation process takes a large sheet of ink soaked paper heated to ridiculous temperatures which causes the ink to literally bind to the fabric. This causes the shirt's image to become amazingly resilient to the ravages of time! This technique can result in small imperfections, generally around the armpit, seams, and stretched spots on the shirt. It is something that is intrinsic with this process but it makes each shirt wholly unique. Made for a great Clark Kent costume, shirt underneath, a bit of cape peeking out at the back. 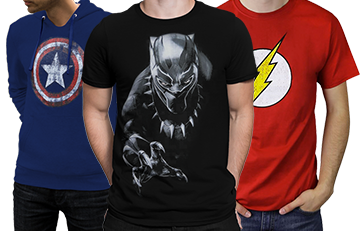 Feel like a Superhero with this fan t-shirt with detachable cape, how cool is that! True to size. Light to wear and great colours as per picture. Post to Australia quite quick. This superman shirt is by far my favorite so far in my collection. The design and material are amazing and the detachable cape is the new 52 design. I LOVE IT! A must have for any true fan of the last son of krypton.